The birds-foot-trefoil is a common flowering plant that has, over the years, amassed a host of common names; names like “lady’s shoes and stockings”, “crow-toes”, “lady’s slipper”, “bacon and eggs”, and “God-Almighty’s thumb and finger”. In all it has been attributed more than 70 different names, most of them related to either the shape or colour of its flowers. This abundant and widespread little plant grows throughout Ireland in pastures and hedgerows and on roadside verges. It also occurs on the coast, and can tolerate a wide variety of conditions across a range of habitats. Bird’s-foot-trefoil is also common in Britain, and occurs across most of mainland Europe, Asia and North Africa. It has also been introduced to north America. 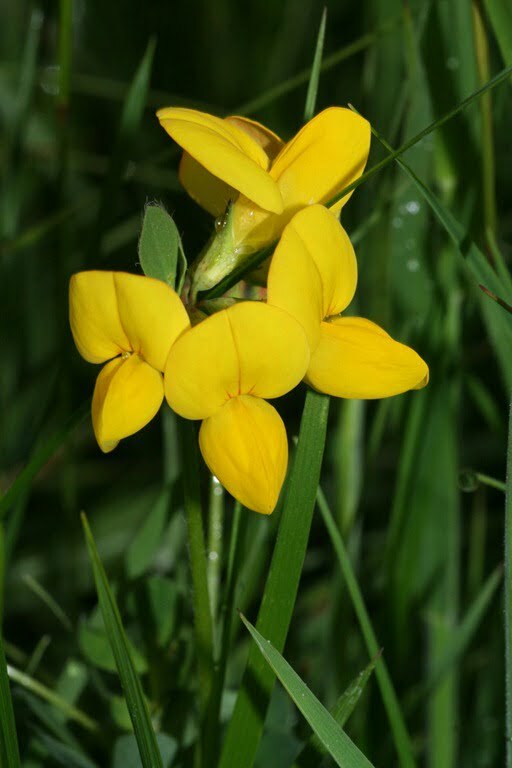 Bird’s-foot-trefoil grows to between 5 and 35 cm (2 and 13.5 inches) high, and from June to September produces bright yolk-yellow pea-like blooms that are often patterned with streaks of red (hence the “bacon and eggs” reference in one of its many common names). The “birds-foot” in the plant’s most common name refers to the claw-like arrangement of its black seed pods, while trefoil comes from the leaves, which at first glance appear to consist of three separate leaflets. In fact closer inspection reveals an extra pair of leaflets near the stem. A member of the pea family (Fabaceae), the birds-foot trefoil tends to creep close the ground, but in meadows it tends to grow taller. If the meadow is subsequently cut or grazed, however, the plant will revert to low growing clumps. The yellow flowers are an important source of nectar for many species of insects, including bees and butterflies. Butterflies, which feed by probing the flowers with their long, delicate proboscis, probably don’t play a role in pollinating the plant. However, more robust insects like bees and wasps, which have to push their way into the flower to get at the nectar, take on the role of pollinators. The birds-foot-trefoil is also an important food plant for the caterpillars of several butterfly species including the common blue, green hairstreak and dingy skipper. Because it is attractive to a wide variety of insects, Birds-foot-trefoil is an excellent plant to incorporate into a wildlife garden, and is often found as a component of commercial wild-flower seed mixes produced for that purpose. As a legume, it also fixes nitrogen from the air – a characteristic that makes it ideal for improving the soil on infertile sites. It is sometimes cultivated along with varieties of clover to improve the quality of pasture, and as a fodder plant for livestock. In folklore the birds-foot-trefoil was often associated with evil – a legacy stemming from its black, claw-like seed pods, which were compared to the Devil’s claws, or to crow’s feet. It was also one of the plants woven into protective wreaths on midsummer’s night – possibly because its tri-foliate leaves suggested an associated with the Holy Trinity. I was searching for the Irish name for birdsfoot trefoil. If you’re looking for the Irish names of wildflowers you’ll find Zoe Devlin’s website on the Wildlflowers of Ireland invaluable. If you’d prefer a more hand-on reference Zoe’s book, Wildflowers of Ireland is an excellent resource.